coastline, it is the northern most surf beach on the east coast of Australia and is one of only three places on the east coast where you can experience a sunset over water. There are many camp-grounds in 1770 but several people had told us that the one to stay at was the one right at the end of the road and so we checked in to the 1770 Camping Grounds ([star][star][star]). Well, it was dusty and dirty and, at first glance, not nearly as nice as some that we’d stayed at, and the best site we could find was right below the road to the lookout. We hoped it wouldn’t be too busy there at night. But the lack of grass and the fine blackish sand that covered the ground turned out to be minor inconveniences; this campground is right on the beach and when the tide came in the whole place became picture postcard perfect. We couldn’t have got a better place to camp if we’d ordered it! We’d arrived at about a quarter to four and by the time the camp was set up it was just starting to get dark. But that didn’t stop us from taking a walk on the beach, feeling the sand between our toes, testing the water which, incidentally, was freezing, and breathing in the fresh salt air. Could Heaven be any better than this? Nearby is the town of Agnes Water and this is rapidly becoming the holiday mecca for this region of Queensland’s coast with a large part of it is covered with million dollar properties. 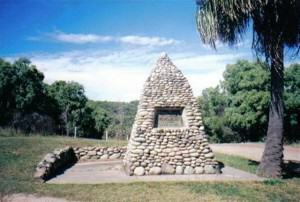 We went for a little drive to this nearby town the next morning and after only a short while we knew that one day soon the town of Agnes Water will be big and we were glad that we had the chance to visit before that happens. Later we walked up to the lookout and what a spectacular view! For 360° it was absolutely out-standing! The water was so blue and clear and it stretched endlessly. In the distance we could see the sails of a boat that looked to be sailing into infinity. There is a memorial cairn at the lookout commemorating James Cook’s landing and we learned that if we had been there the previous week we would have been right in the middle of the 1770 Festival where the community holds an annual re-enactment of that historic landing. 1770 and not fish! So after lunch that day we picked up the fishing rods and off we went to a nice, open little beach that was almost deserted. John cast his line and I settled in for a relaxing afternoon on the sand but the sun was pretty fierce and I could feel myself burning so it was off to the shade for me. But John was having a great time on the beach catching fish after fish. The only problem was that they were all undersize and he had to throw them back. If you’ve ever wondered where Neptune’s Nursery is, well wonder no more because it’s right here at 1770!! But that wasn’t stopping John, he was having a ball. It was while he was standing on the beach that the LARC (Lighter Amphibious Resupply Cargo) vessel came in. There are 2 of them and they are operated by 1770 Environmental Tours. 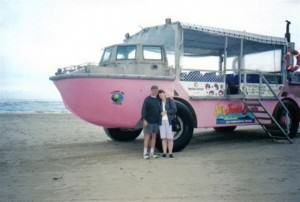 These large pink … are they boats or buses? Well anyway, we were fascinated and a I just had to have a ride on one of them!! Plans were made and we packed up the fishing gear and went to the marina to see if we could get on the LARC but they were booked out for that day. However, the next day’s sunset cruise had seats available. Perfect. 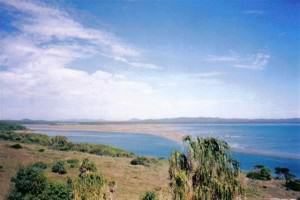 While at the marina we also looked at the Lady Musgrave Island tours and the Great Barrier Reef tour that takes in the protected Fitzroy Reef Lagoon. The Town of 1770 is the closest point to access the Southern Great Barrier Reef but a lack of time for us meant those tours would have to wait until the next time we come this way. The next day dawned warm and humid and we had a late start. It was a day to spend some time on the beach and then John did some fishing off the rocks this afternoon but didn’t even get so much as a bite. Later in the afternoon a cool change moved in just to remind us that it was winter. 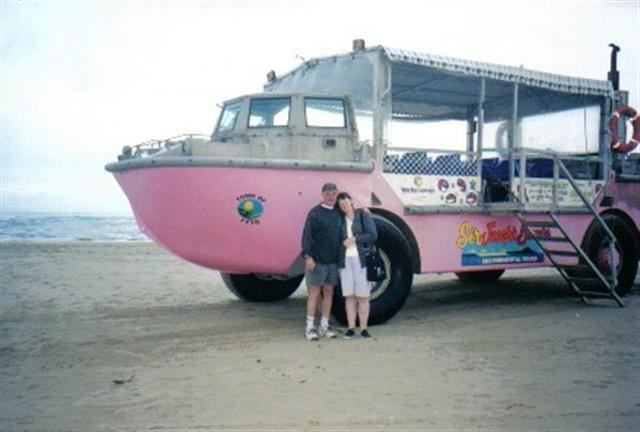 By the time we were ready to set off for our sunset cruise on the LARC the weather was overcast, windy, and cold! We still enjoyed our cruise even if we didn’t see much of the sunset. But I wouldn’t have wanted to be the type who gets seasick, the swell was making our trip very interesting! Up and down, up and down … no, not a bit seasick! And a pod of dolphins joined us, swimming alongside for a short while. They are such beautiful creatures, very graceful and serene. They were jumping out of the water and doing all those amazing things that dolphins are famous for, unfortunately a little too quick for my camera (or me for that matter!) We stopped on one of the sandbars for a few minutes before the return journey. It’s amazing that when the tide is in this whole little “island” is completely submerged. weren’t going to let a little rain spoil it for us now. Famous last words as it turned out. We were pleased to discover in the morning that the tent doesn’t leak. It rained heavily throughout the night and the fine dust of the campsite became fine mud; it made packing up interesting and messy! At least the rain had stopped by the time we were ready to take the tent down and not long after we were packed the sun came out for what turned out to be another glorious day. But it was time to say goodbye to 1770 and move on to our next stop. That old tourist blurb of Queensland being beautiful one day and perfect the next is true. 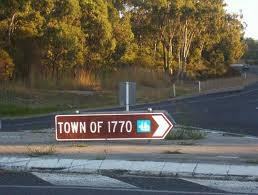 In fact I think they had 1770 in mind when they thought it up. 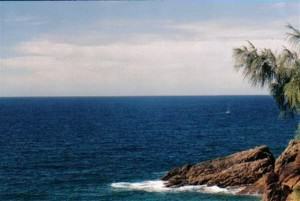 The Town of 1770, where the surf meets the reef, is a paradise just waiting to be explored. So, what are you waiting for?